I almost feel that I have to write two conflicting reviews for this book. In one light, this was a great book. In another, it was a disappointment. Depending on what you're looking for in this book, it could go either way, so I'm going to try to address both viewpoints. The story of the Marquis de Lafayette is one of the best that you can find. Basically, he was the word's richest orphan who decides to rebel against his father-in-law by fighting with the Colonists in America, is sort of adopted by George Washington, and becomes an American hero. And, think about it, how many things are named "Lafayette" in the US? While we might not think of the man, we definitely remember him in different ways. 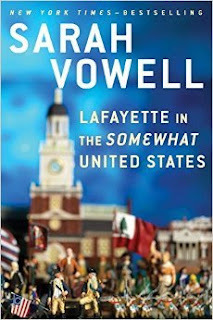 Vowell very cleary relates his story in the American Revolution. I've always said that she's an author of history for people who don't like history. Her prose is clear and you can easily follow her narrative as she travels with Lafayette through the war. The best way I can describe it is that it is the transcript of a very engaging professor giving a lecture in History 201. As far as bringing the figures in this slice of history back to life, Vowell is successful. While I think breathing life into peple who fit a mold modern audiences understand (like Lafayette) or people who are already so well-known (like George Washington) isn't that great of an accomplishment, she gives the same treatment to many of the other characters who don't play as big a role or who aren't as widely remembered, such as the British General Clinton or the French Admiral DeGrasse. If you went into the book knowing nothing or next to nothing about Lafayette and you've forgotten your high school history lessons, you'll come out of this book able to hold a conversation with anyone from a history buff to a reenactor at Colonial Williamsburg without any problem. That is probably the greatest success of this work. While I can't fault Vowell her research, I can't help being critical on how little of herself she put in this book, compared to her earlier books. Frankly, this book--when you are expecting something like Assassination Vacation or The Partly Cloudy Patriot--comes across as just dull. I think there were far more opportunities for Vowell to use to inject her signature style than she utilized, which was a disappointment. There was one other thing that bothered me about this book--there are no chapters! In fact, there are very few narrative breaks (you know, the extra space between paragraphs) which I found frustrating for two reasons. First, I like having a nice place to stop so that I can, you know, sleep. I get it--that's a completely selfish reason and, at first, I told myself to get over it. But then I realized that the lack of chapters was the root of another problem. Without any narrative breaks when she shifts topics, the book starts to feel disorganized. I mentioned above that this was like a transcript of a lecture--which is pretty accurate. That may not bother some readers, but I found it irritating and distracting. This was definitely an up and down experience for me. Personally, I found it disappointing, but I also think that other people, who are reading it for different reasons, may have a much more positive experience with it.